Organise a free appraisal with a top real estate agent before you sell. A value estimate of your property, before you talk to agents. For Sale by Owner refers to the practice of selling your home without the guidance of a real estate agent. This is quite often done as a cost-cutting measure by budget conscious vendors but that’s not the only reason you might choose to eschew using an agent. This article will review leading websites which promise to make selling your own home easy and to help you get a similar price as you would with an agent. While selling your own property might sound appealing, real estate agents often bring more to the table than you realise and without one, you risk getting less for your property than you should. How big is Australia’s for sale by owner market? If you’re a budget conscious property owner, you’ve probably considered selling your home without a real estate agent. After all, why pay thousands in agent fees when you can get a similar price selling your home yourself? In the real estate industry, selling without an agent is known as for sale by owner. Sometimes, the process may be referred to as selling privately, which shouldn’t be confused with the private treaty method of sale. It means you are responsible for all aspects of your property’s sale, from advertising your listing to arranging open houses. The upside of for sale by owner is that you save money on agent fees. The downside is that you risk selling for a lower price than what you could have achieved with an agent. What’s a prospective seller to do? 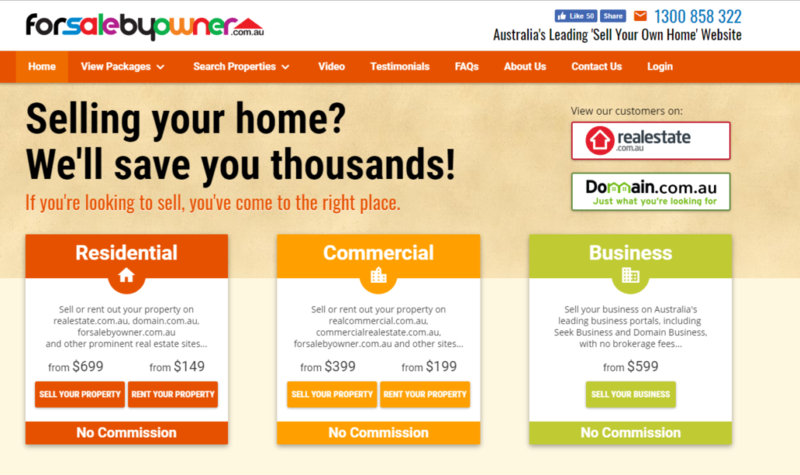 Give an overview of 12 leading Australian for sale by owner websites. Still on the fence? Have a look at some reasons why using a real estate agent could really help you out. The first time you sell without an agent can be daunting. You don’t have an expert to guide you through the process. You have to craft your own advertising copy, arrange your own photographs and know what your property is really worth. You also have to be objective about your property’s shortcomings, which isn’t easy if you’ve lived in a home for many years. For a flat fee or ongoing monthly rate, many of these websites will include extras like for sale signs, monthly reports, brochures and advice from property experts. 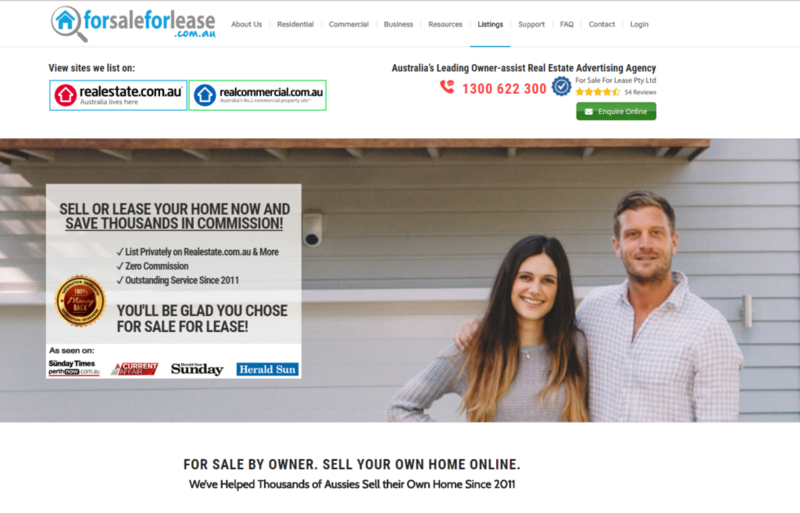 Some real estate websites, like realestate.com.au, don’t allow individuals to list properties. 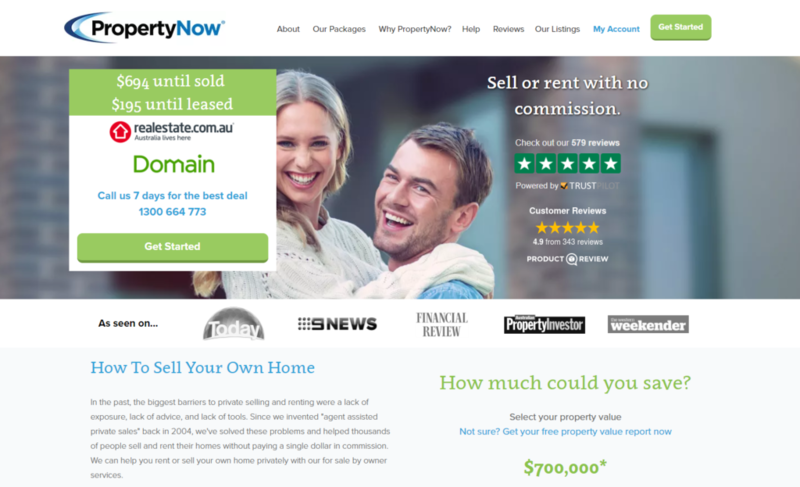 To get around this, for sale by owner websites generally secure a real estate licence. 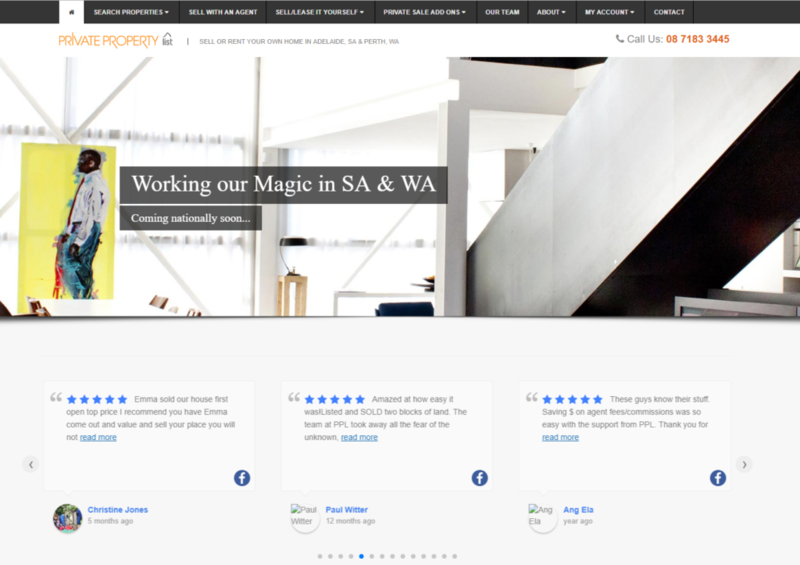 Part of their value comes from being able to list properties on realestate.com.au and others as an ‘agency,’ even though they are not technically agents and do not charge agent fees. We analyse these websites in more detail throughout the article. Scroll to the end for an overview of each. Here’s a clue: It’s not as big as you think. For sale by owner properties represent around one per cent of all properties sold in Australia. Of the 500,000 homes sold in Australia in the last 12 months, just over 5300 were sold by an owner, just over 1% of sales. All of the for sale by owner websites listed above have profiles on realestate.com.au, which disclose the number of properties sold. We examined recent sales data for 12 for sale by owner websites to see how many properties sold in the last 12 months (December 2014 to November 2015), and in the 12 months before that (December 2013 to November 2014). 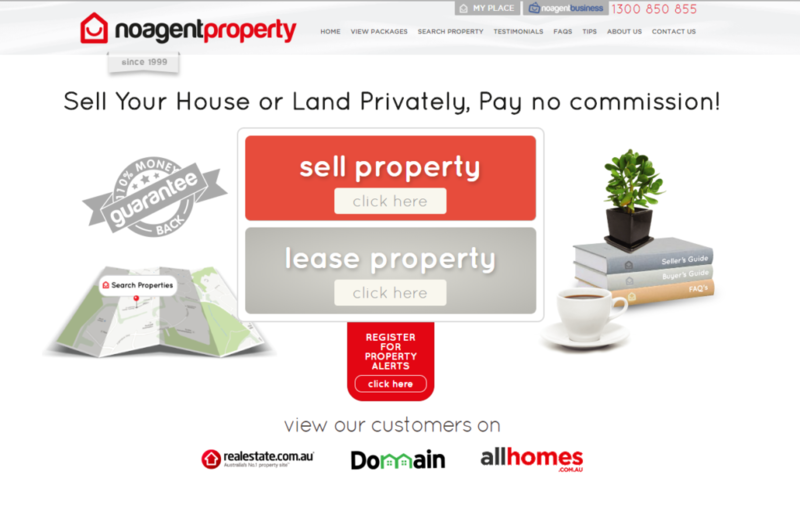 To derive sale numbers, we counted the number of sales listed on each website’s agency profile on realestate.com.au. We were surprised to discover that most for sale by owner websites don’t have the numbers to support a large network of interested buyers. Half had sold fewer than 200 properties in the past 12 months. Private Property List sold just eight properties. Cubbi sold 55, and Real Estate Your Way sold 70. 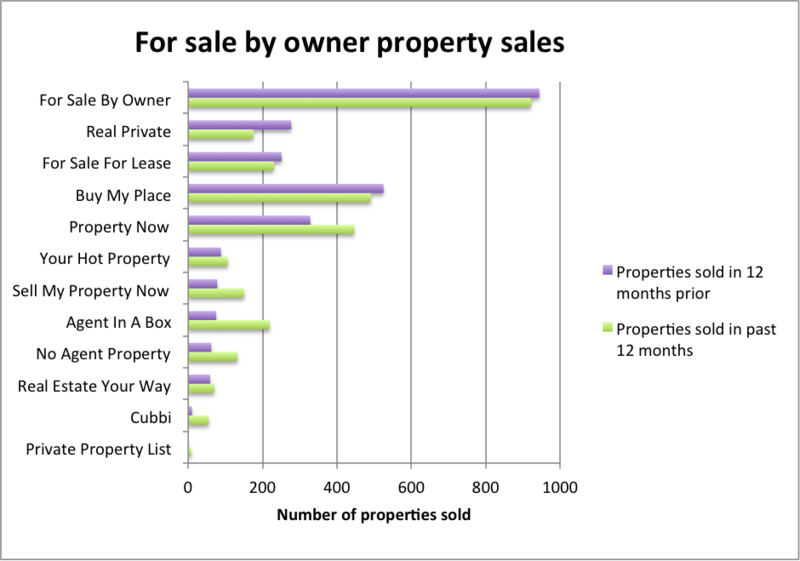 For Sale By Owner and buyMyplace made the most sales in the past year, with 922 and 491 property sales respectively. But that’s still far less than what a larger website like Domain or Allhomes would sell in a week. Our findings show that for sale by owner websites sold an extra 300 properties in the last 12 months compared to the 12 months before. That growth is nothing compared to the hundreds of thousands of homes sold every year by agents. 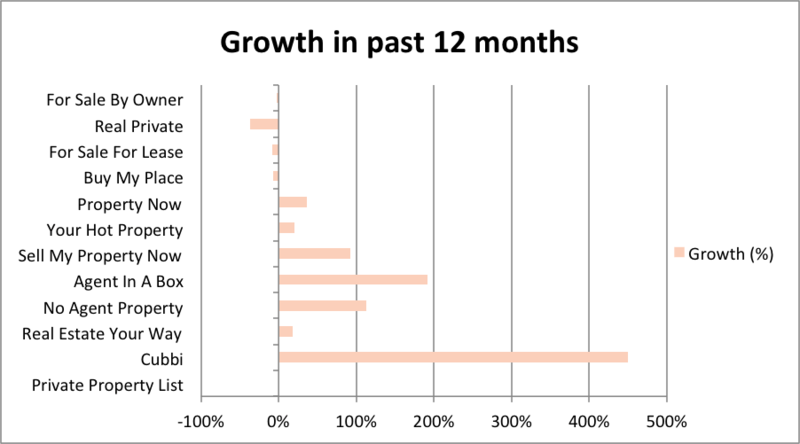 The graph below shows which for sale by owner websites have grown the most in the past 12 months. However, some parts of this graph are misleading. While Cubbi and Agent in a Box experienced the highest growth (400% and 200% respectively), Cubbi increased its number of properties sold from 10 to 55. Agent in a Box’s performance was slightly more noteworthy, selling 219 properties in the past 12 months compared to 75 in the 12 months prior. 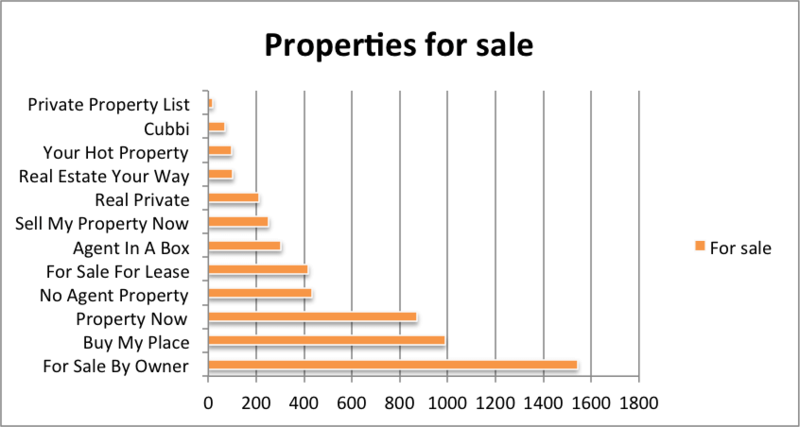 For Sale By Owner sold the most properties overall, with 922 in 14-15 and 944 in 13-14. But it contracted by 2 per cent this year. You might think Australia’s for sale by owner market just needs time to mature. Sure, it’s sleepy now, but there must be overseas markets where for sale by owner is thriving? To answer this question, we examined for sale by owner data from the United Kingdom. The UK’s property market is more mature than ours, and local property analysts often use UK data to predict Australian trends. We found that for sale by owner has similar market penetration in the UK as in Australia. Of the 1.2 million properties sold in the UK every year, just 10,000 are sold by owners who don’t use agents. That’s less than one percent of all property sales. The biggest change to the UK industry most recently is the emergence of a hybrid real estate model called Purplebricks. It operates both online and offline using professional agents and charges one-tenth of traditional real estate property fees. Purplebricks has managed to capture a 62% share of the online industry and is now the third largest real estate agent in the UK in just under two years. At the moment they cover around 5% of the entire real estate market with experts predicting coverage of at least 50% by 2020. They plan to open offices in Australia before the end of 2016. The importance of a real estate agent as an intermediary is reflected in the numbers, both in Australia and in the UK. Excluding off market transfers, agents generally sell between 90% and 95% of all residential properties in Australia – and this probably won’t change any time soon. While Australia has plenty of for sale by owner websites, most are too small to be of real significance. However, the emergence of the hybrid real estate model in Australia may shake things up a little in all areas. If you have extensive real estate experience and don’t need the extra services of an agent, for sale by owner might be for you. For the rest, it can’t hurt to contact a couple of agents in addition to exploring for sale by owner options. You might hate paying agent fees. But that doesn’t mean it’s always a good idea to sell your home yourself. As we mentioned earlier, working without an agent means you could end up selling your home for a lot less. Instead, you should find a great agent whose value exceeds their commission cheque. They should be committed to getting you the best sale price possible. If you plan on selling your home yourself, there are plenty of websites to help make your job easier. 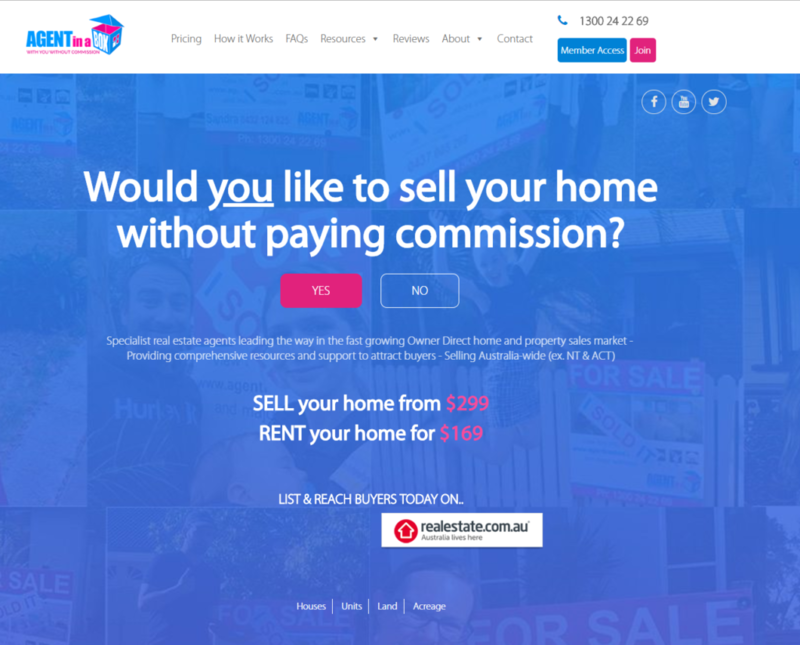 All 12 websites include options to list on realestate.com.au. If you’d like to advertise on Domain, be prepared to pay more. Real Private “aims to provide our clients with all the benefits of a traditional full service agency. The internet has become virtually the only property search method used by potential buyers and we believe that with some assistance from the owner, the cost for selling your home can be reduced by 95%.” They say that they are able to be cheaper than all of their competitors by providing everything a traditional real estate does other than conducting inspections. It offers two ways to pay . Both include listings on the main Australian real estate websites and up to 25 photos online. You can also pay extra for additional services like photography and home brochures. Listing your property on Domain.com also attracts an additional cost. 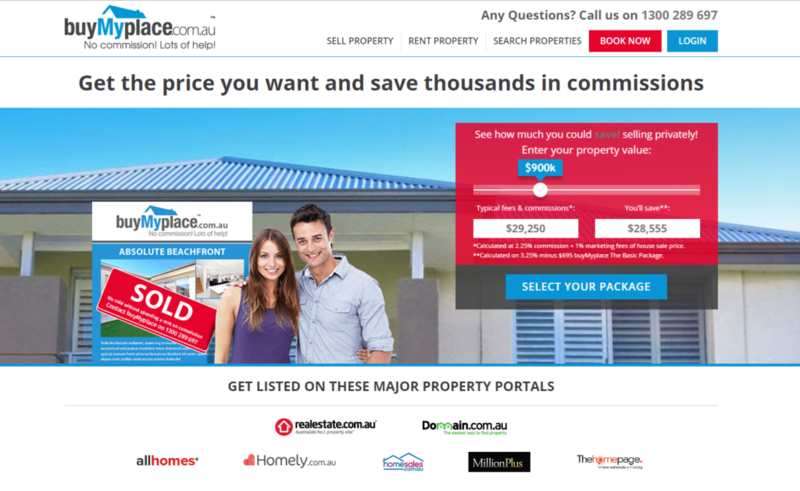 buyMyplace claims to be Australia’s leading online for sale by owner real estate marketing and advertising service. You also have the option to sell via auction for $895 in conjunction with any package. The prices listed are for metro areas only -selling in rural areas may be more expensive. Ultimate ($965) – Same as premium, plus listing on Juwai.com, a Chinese property portal, and social media exposure. There is also the option to create a custom package to suit your particular needs. Ultimate ($699) – Everything in Premium, plus listing on juwai.com, a brochure and professional proofing and editing of your ad copy. According to For Sale For Lease, the best person to sell your home is you. Anything an agent can do, you can probably do better. It offers two packages, which both include listings on all the major real estate websites (Domain costs extra). 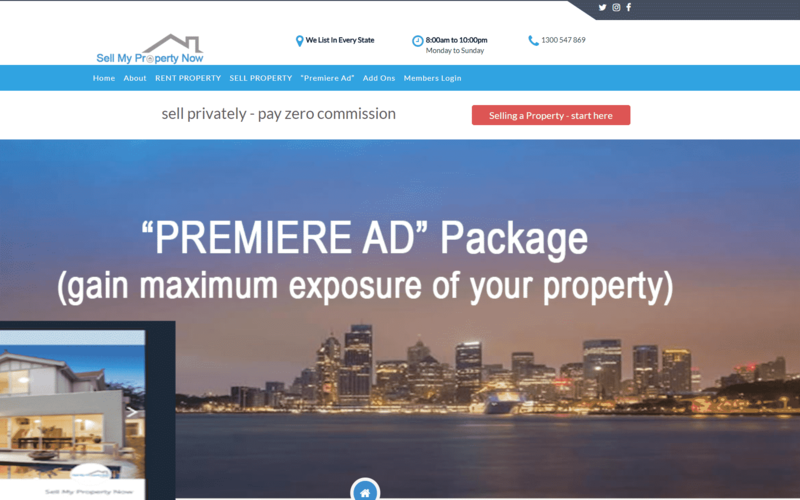 Sales package ($649) – suits private sellers looking to list their property for sale online. Monthly package ($169) – suits professionals looking to list their property for sale online. $99 per month after initial month. You can also pay for Add Ons like printing of your brochures and different signages. Cubbi is mainly used to help tenants find properties to rent, but it also helps people sell their homes without agents. Your Hot Property is for homeowners dissatisfied with traditional real estate agencies and associated high costs. 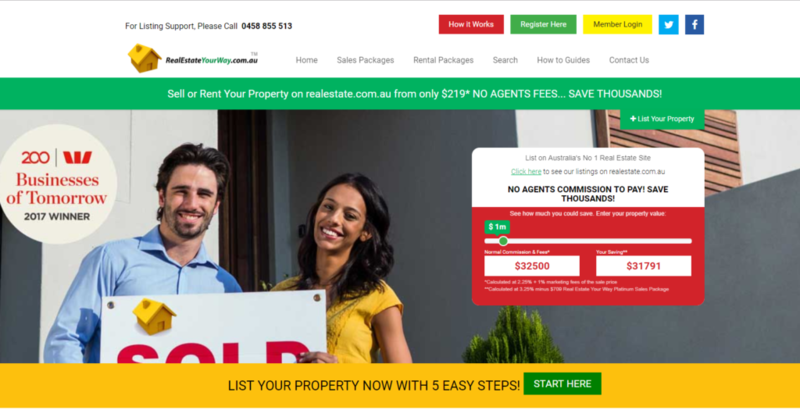 Packages start at $449 to advertise on realestate.com.au and other websites, or $699 to include Domain. There are also a selection of available add-ons such as glossy flyers and professional photography. There is obviously an emerging market for services which help owners sell their own property and it could save you some money when selling a property. However, there’s a reason why only about 1% of vendors in Australia opt to sell their home without a real estate agent. When you pay for a real estate agent, you’re paying for expert local knowledge, support from an actual person, marketing help and so much more. You’re also paying for someone else to do it all for you, freeing up your time to do things that are much more interesting! Top real estate agents will work hard to get you the best price for your property. Which Real Estate Agent makes finding top real estate agents in your area simple – we’ve already done the research for you! Looking for a good real estate agent? Find out who are the top individual agents in your suburb with our free real estate agent report. Should you sell your property without an agent? Selling without an agent may save you money in the short-term, but you may lose money by undervaluing the property yourself. A real estate agent provides the expertise and know-how to give you an accurate property valuation; as well as the marketing and advertising you need to sell your property for the best possible price. It is normally recommended to seek obligation free advice from a top local real estate agent before selling your own property privately. How many people sell property without an agent? Only 5-10% of the properties sold in Australia are sold without a real estate agent. Properties sold privately generally sit on the market longer than those marketed by a real estate agent. Where can I list my property without an agent? Organisations like Real Private, or For Sale By Owner will list your property on sites like Realestate.com and Domain for a fixed fee.